When I went to the NYC dot gov events calendar, I thought they were kidding. 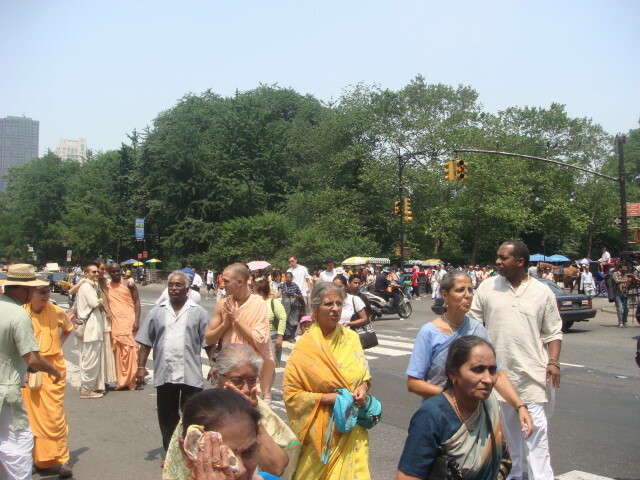 They had the annual Hare Krishna parade set to go from 59th Street on Fifth Avenue (right at the corner of Central Park) going down to Washington Square Park. That would make it a three mile route. 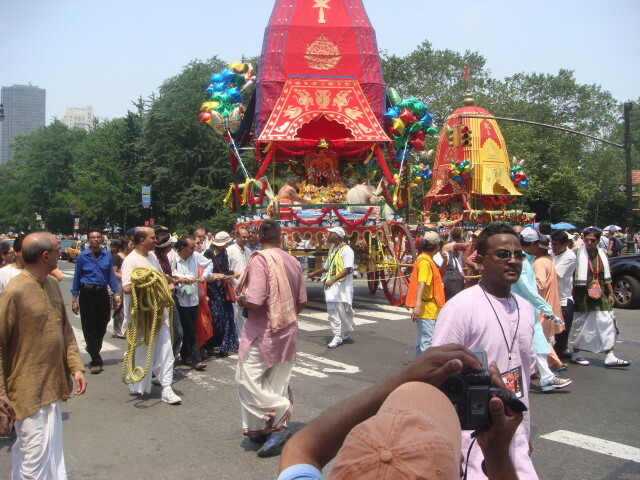 New York may be one of the last places in the USA with an active Hare Krishna population, but it sure couldn’t support a three mile long parade. On Fifth Avenue, too. Fifth Avenue gets most of the biggest parades. So, I decided to test the waters and went to Fifth Avenue and 41st Street and found absolutely no preparations for a parade. No barriers. Traffic running non-stop. I even asked a Public Safety Officer about it and he said he hadn’t heard a thing. I’ve actually seen it before. Last year, I was wandering around the Park and had seen part of the parade. So, I knew for a fact where they started. I decided to go there and see if it was on or off. So I went up and sure enough, they were gathering. Lots of them. Well, not a tremendous number. By far the largest ethnic group were from India, but there were a lot of Caucasians and quite a few Blacks as part of the gathering. 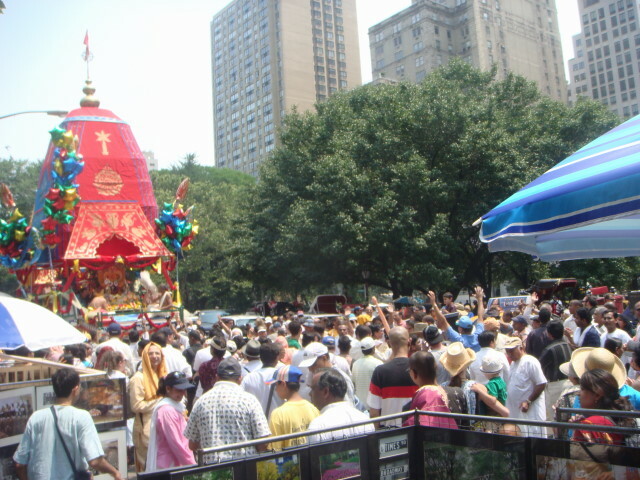 Just after noon, the parade started. There was one vehicle in the parade and it led the group. 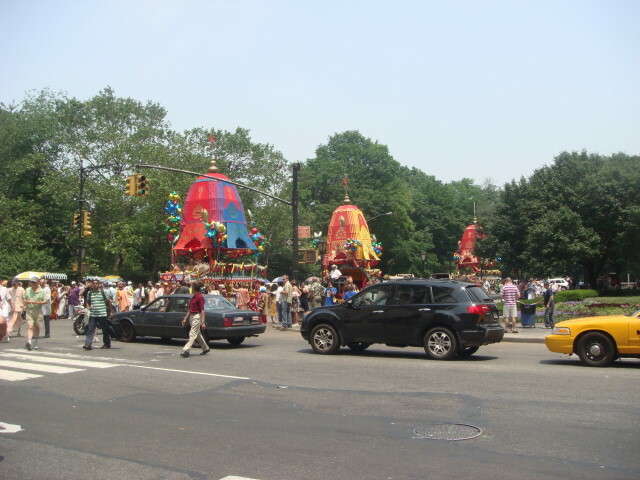 It had the Hare Krishna/Rama chant written on it and they were blaring it from some loudspeakers, but not obnoxiously loud or anything. I got to the front of the group and started snapping some pictures. Most of the crowd just followed along behind the lead vehicle. The crowd was pretty diverse, but it did appear that people were wearing their traditional clothing for it. Not all by any means, but most. The next picture is pretty interesting to me. 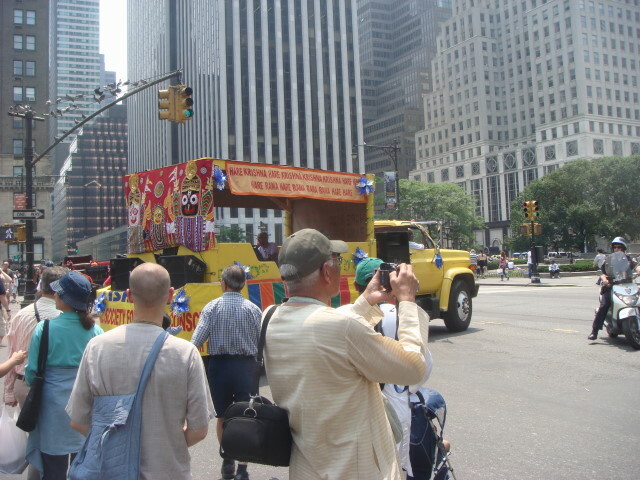 You see, besides the lead vehicle and the crowd behind it, the entire parade consisted of three floats. In this picture, I captured all three of the remaining floats. The floats were some sort of temple or temple-standin. 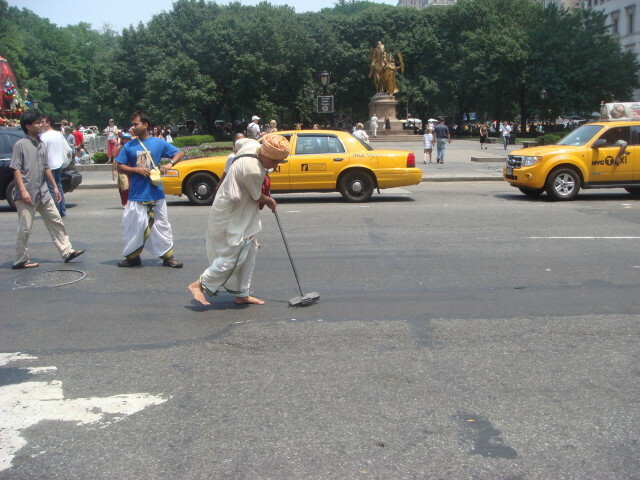 This guy led the first one and was symbolically sweeping in front of it. Each of the floats (well, of these three floats) were self-powered by volunteers. 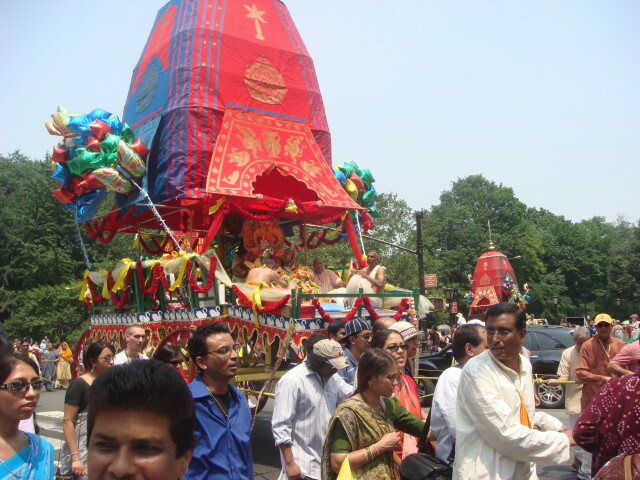 That is, members of the crowd joined in to pull the floats with attached ropes. It was extremely democratic. When I had been in the original crowd, a guy with a loadspeaker had been asking for volunteers to pull them. The floats all contained an area with people in it. I presume they are the leaders or otherwise are dignitaries…or just people who were happy to ride in the heat of the day. I never caught any sort of idea of exactly what the floats were supposed to symbolize or honor or whatever. Here’s the third float. That is, the second of the self-powered ones. This was my best picture of the pulling action of the worshippers/volunteers. This one seemed to have a special symbolism. I noticed that the pullers were mostly female. Maybe they were all female, I spotted that issue when I was taking a picture and didn’t notice if the pullers in front were male or not. The end of the parade. This guy was just at the back end of the fourth float. He wasn’t a tall guy, but look at how he compares to the wheel. These were tall floats. And so ended my coverage of the parade. From the time the first float/vehicle past to the last was 15 minutes. They don’t block off Fifth Avenue for that size of a parade. I think they just marched them down one lane of Fifth Avenue all the way down. I see that a lot in the smaller parades or in parades that are using 2nd or 3rd Avenue. I hadn’t realized they would do it for Fifth. 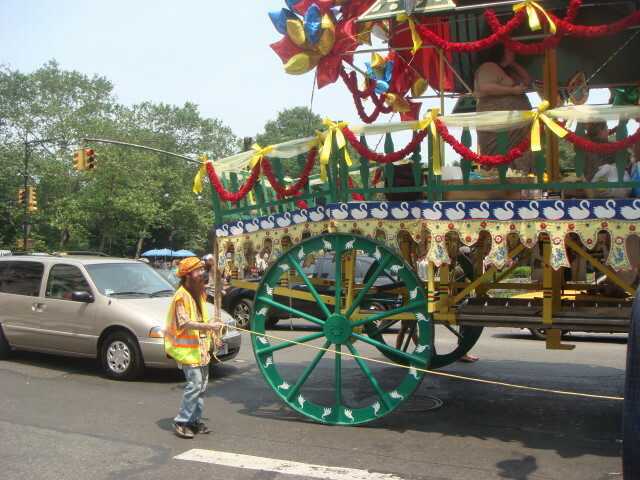 This entry was posted on June 14, 2008 at 6:47 pm and is filed under Events, Manhattan, Mid-town, Parades. You can subscribe via RSS 2.0 feed to this post's comments. You can comment below, or link to this permanent URL from your own site. 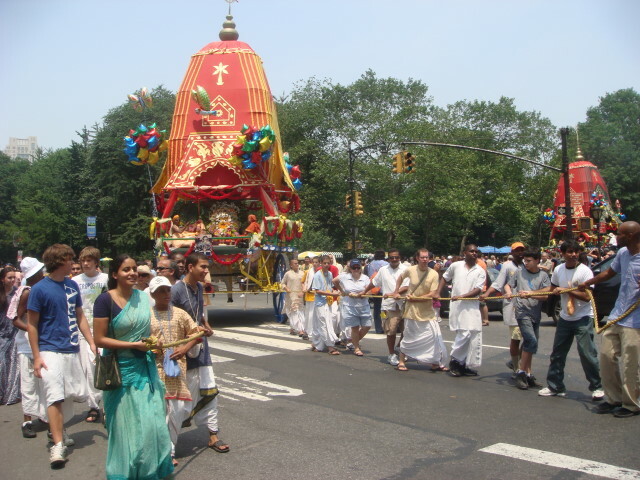 I’ve been affiliated with the Hare Krishna Movement since ’69 and participated in the first New York Rathayatra in the summer of 1977. I got a big kick out of seeing your photos and reading your comments. 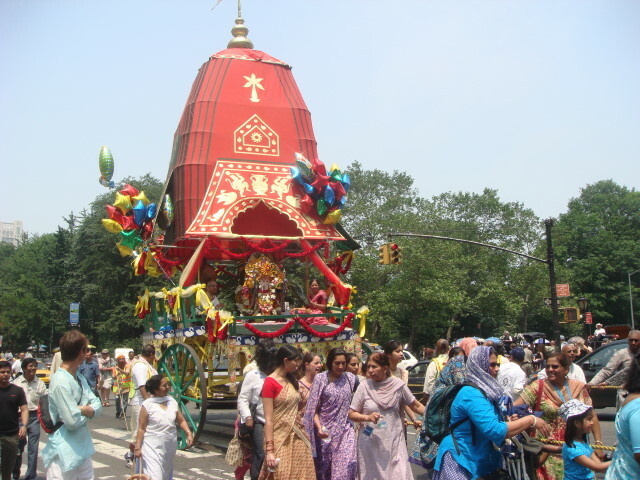 You let me see our Rathayatra festival through the eyes of an objective onlooker (with a camera) and it was refreshing — especially that you kept an open mind about the whole experience. Very nice. 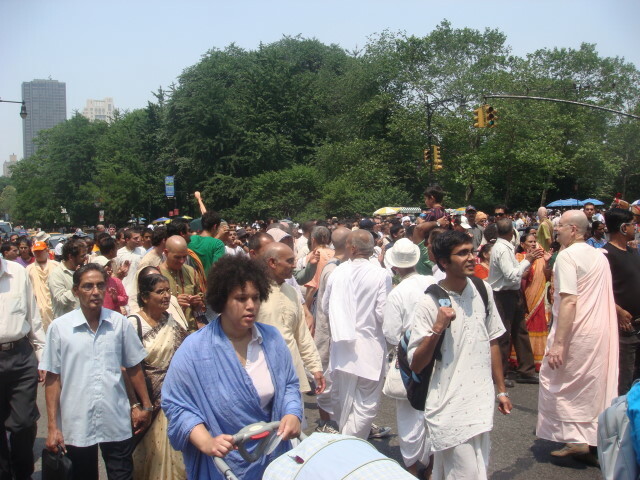 Did you know that the very first Hare Krishna center was opened in 1966 at 26 Second Avenue? A few years later they relocated a few blocks “uptown” to 61 Second Avenue (between 3rd and 4th Streets). That’s where I joined. At the time the East Village was still the center of hippie culture. The Fillmore East was only two blocks from us. A few nights a week we’d go out chanting — up St. Marks Place to 6th Avenue and the West Village and then back down to 2nd Avenue via Bleeker, MacDougal and The Bowery. Thanks again for sharing your photos and observations. Jeffco Trails Update from Jan KrayWhite Ranch Park Rawhide Trail (which is also a service road) from the main (west) painkrg lot north to Sourdough Springs Campground. Work including re-grading, re-ditching, de-berming and culvert replacements. Expect heavy equipment and partial to full trail closures for intermittent time frames during the workday. Work to be performed Tuesday through Friday 8 am 4:30 pm. Work is scheduled to begin August 10 anticipated completion by August 31.Alderfer/Three Sisters Park Main painkrg lot at LeMasters and Buffalo Park Road. Lot will be completely reworked to correct drainage issues and lessen long-term maintenance concerns. Beginning July 31st preparation work will begin. Next Tuesday August 7th -August 9th a full closure of the painkrg lot will be necessary. Parking is available along LeMasters Road and in the paved lot on Buffalo Park Road. Thanks, actually my question was answered in the positive, as I did see it being started that way in another video on the website. I assumed it would start with a firesteel, as the paraffin binders in there are very similar to wetfire, etc. Nice product by the way I placed a couple of spoonfuls on the ground and was impressed by the very lengthy burn time.